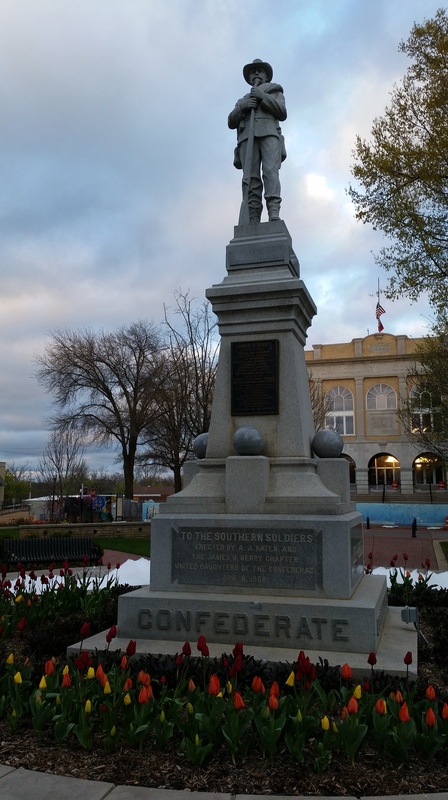 In 1908 the United Daughters of the Confederacy dedicated this anonymous soldier monument in Bentonville, Arkansas, later adding a plaque honoring Confederate James Henderson Berry (wikigringo/wikimedia). These monuments were being constructed as the war was entering into the realm of “postmemory”; that is, it was “remembered” by a generation who actually had no firsthand experience of the war but was nonetheless traumatized by its effects and the testimony of those who had lived through it (a notion developed to interpret Holocaust memory). That generation was eager to rebuild the South and claim a common White heritage. As memorialization reached beyond the confines of cemeteries, one of the most prominent unifying symbols of the White South and North alike was the statue of an anonymous foot soldier patrolling the early 20th century courthouse lawn. In the final quarter of the 19th century Kirk Savage argues that the everyday White soldier underscored community service to the competing national causes while underscoring that citizenship was restricted to Whites. The most famous rebels found prominent places in Southern cities, where they became symbols of a moral cause rather than a vanquished nation. No figure was more celebrated than Robert E. Lee, who was commemorated in a host of Southern cities including a New Orleans monument in 1884. In 1876 planning began for perhaps the most famous Lee monument, a Richmond, Virginia statue on Monument Avenue that was completed in 1890. Confederate General J.E.B. Stuart followed Lee to Monument Avenue in 1907, Confederate President Jefferson Davis was installed a month later, and Thomas “Stonewall” Jackson joined them in 1919 (eventually Confederate naval officer Matthew Fontaine Maury was included in 1929 and a statue of African-American tennis player and activist Arthur Ashe was erected in 1996). The memorial landscape extended far beyond statues alone: for instance, in the early 20th-century a host of roadways also were renamed for Confederate heroes, of which the 4000-mile long Jefferson-Davis Highway system is perhaps best known (PDF). 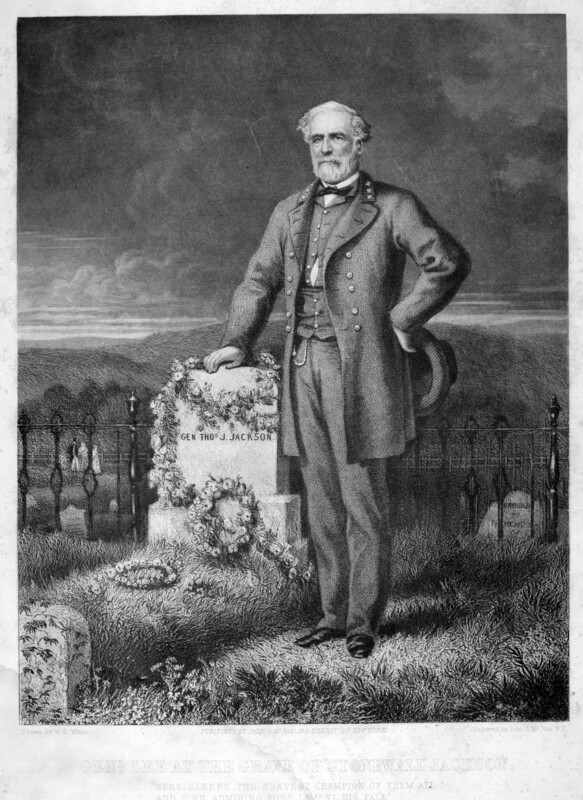 This 1867 lithograph depicted Lee at Stonewall Jackson’s grave (North Carolina Archives/wikimedia). 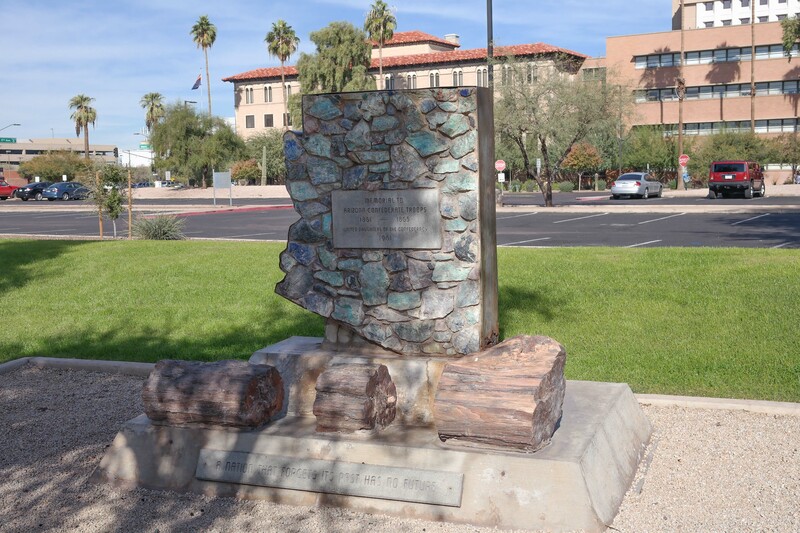 Arizona had a short secessionist history and could lay claim to Confederate heritage, but the state made no contribution to the turn-of-the century Confederate monument boom. William Stoutamire’s 2010 study of Arizona’s Civil War heritage indicates that the state’s first Civil War monument was not erected until 1928, and it memorialized three California Cavalry soldiers killed in 1862. In April 1862 Confederate rangers engaged Union cavalry at Picacho Peak and killed three Union soldiers in the war’s westernmost military confrontation (compare coverage from The Petaluma Argus). Yet the Confederate foray into Arizona was a history that remained largely un-commemorated for most of the century following the war’s end. Confederate sympathies swelled in the South after World War II, buoyed by White anxieties over the Civil Rights movement. The postwar affection for a romanticized Confederate history would extend its reach into Arizona, where one of the most prominent national opponents of civil rights reforms was Arizona Senator Barry Goldwater. 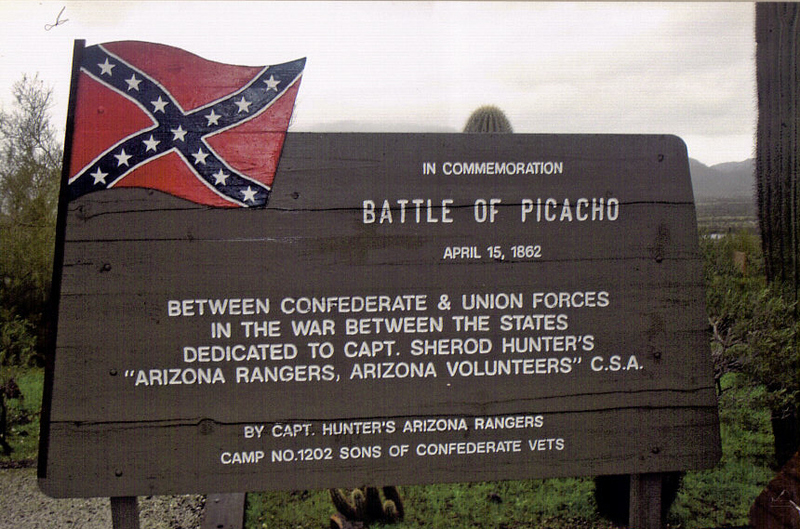 In August 1950 a group met in Tucson to consider forming a chapter of the Sons of Confederate Veterans, and they indicated they were contemplating the construction of a Confederate monument at Picacho. In 1951 reenactors dressed as the Arizona Rangers marched in the Tucson Rodeo Parade (and the Sons of Confederate Veterans continue to participate in the annual event). 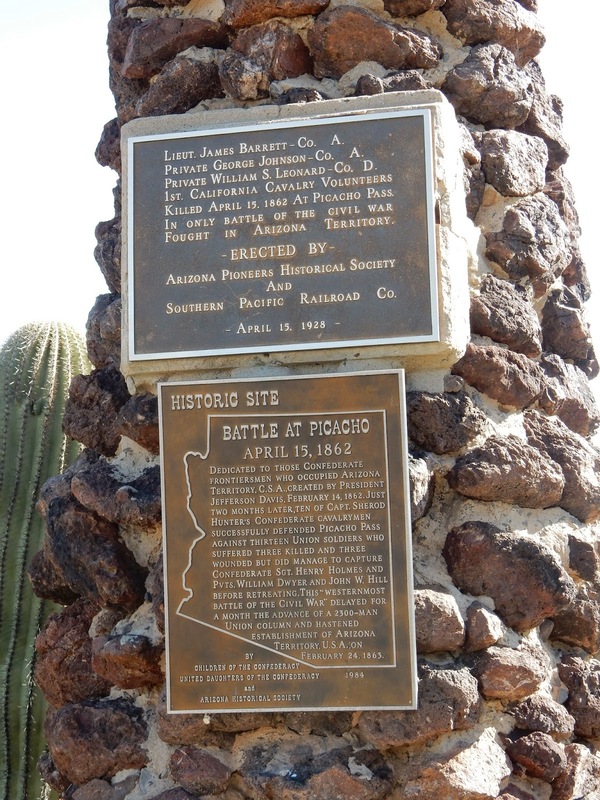 In 1958 the Sons of Confederate Veterans Camp 1202 erected a memorial to the Confederate rangers who fought in the “War Between the States” battle at Picacho. Four years later during year-long Centennial celebrations 5000 people gathered for a reenactment of the Battle of Picacho Pass. 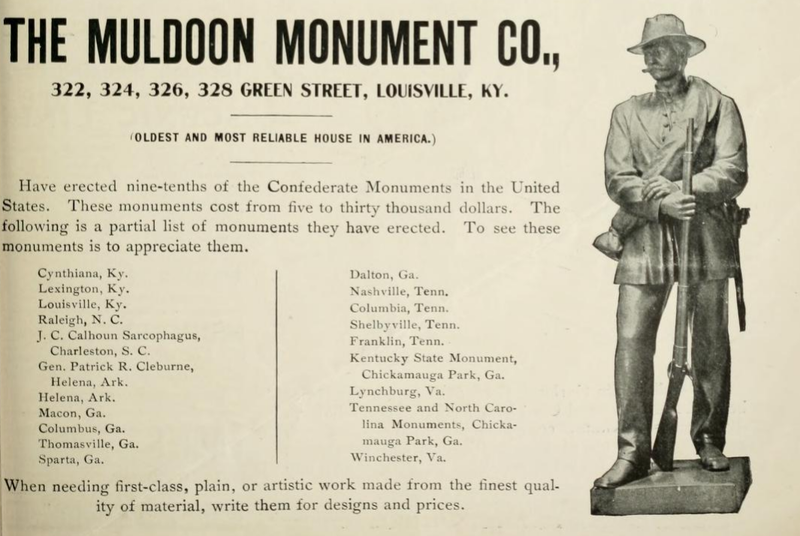 In 1900 a sufficient number of monuments were being erected that Confederate Veteran included this advertisement for Louisville, Kentucky’s Muldoon Monument Company. The United Daughters of the Confederacy formed in 1894 and has remained among the most active proponents of memorial construction, pro-Southern histories, and textbook “accuracy” that remain at the heart of neo-Confederate movements. Mildred Lewis Rutherford, for instance, was Historian of the United Daughters of the Confederacy as well as the Confederated Southern Memorial Association, which formed in 1900 to unite a vast number of ladies’ memorial associations in the vanquished Confederacy. The prolific Rutherford penned a series of popular histories that selectively borrowed from or grossly misrepresented primary documents, but the themes she championed remain enormously attractive to many contemporary ideologues. Rutherford argued that the Constitution was a compact between sovereign states; consequently, the Confederacy’s secession did not constitute a rebellion, a theme often featured in neo-Confederate histories painting Lincoln and a circle of Northerners as coercive warmongers (compare this 1920 Confederate Veteran article). Much like a century of Confederate apologists, Rutherford’s imagined war was not fought over slavery at all, and she painted an abhorrent picture of placid and well-treated captives. This 1920 passage from a Mildred Lewis Rutherford study outlined some of her rules for assessing historical textbooks on the Confederacy. All of this fueled Rutherford’s zealous lobbying for revised textbooks, which she argued should not refer to the war as rebellion, suggest it was fought for slavery, indicate slaveholders were cruel or unjust, or glorify Lincoln while villifying Jefferson Davis. A textbook committee under Rutherford’s direction vigorously patrolled school books and reported on those textbooks that did not equitably represent the South. In 1921 Rutherford published one of the most jarring revisionist histories, a school pamphlet called The Truth of the War Conspiracy of 1861. Huger William Johnstone’s 52-page tract boldly laid the responsibility for the Civil War at the feet of Abraham Lincoln and a complicated conspiracy to start the war. In 1922 the United Confederate Veterans unanimously endorsed the report, “which proves the Confederate War was deliberately and personally conceived and its inauguration made by Abraham Lincoln.” While such conspiracy theory histories dramatically distorted the war, Rutherford’s books are still in print, and her defense of Southern “home rule,” antebellum life, and natural social, racial, and gendered hierarchies remain emotionally powerful for many audiences a century later. The Phoenix monument was erected in the midst of a backlash to integration that witnessed a similar embrace of reactionary Confederate history in many other communities. Despite memorial-makers’ best efforts to cast their messages as timeless, though, it is impossible to separate memorials’ 21st-century reception from contemporary experience. While Phoenix contemplates the local meaning of Confederate things on the public landscape, other communities have removed or seriously contemplated removing such monuments. 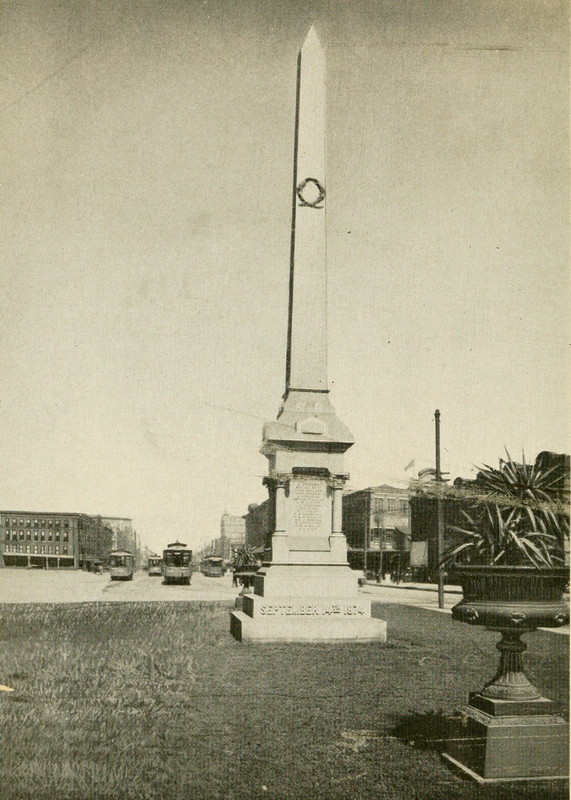 The Lee Monument in New Orleans in about 1900. New Orleans’ Robert E. Lee Monument was erected in February, 1884, becoming part of an especially rich Confederate landscape. Some of the contention over these memorials was prosaic: In 1953, for instance, there was public outcry when a sign was hung at the statue during maintenance indicating it was under “reconstruction,” which was hastily changed to “rebuilding.” However, more consequential tensions were often played out in the shadow of General Lee. In January, 1972, for instance, a memorial parade marking Lee’s birthday laid a Confederate flag at the foot of the Lee monument and included in the parade Klansman Addison Roswell Thompson. Between 1954 and 1975 Thompson ran 14 unsuccessful campaigns for New Orleans Mayor or Louisiana Governor on an unabashedly White supremacist platform. During his 1966 gubernatorial campaign, for instance, Thompson indicated he stood for “`states rights, free enterprise, racial segregation, individual freedom and keeping government out of businesses that can be handled by private enterprise,’” and punctuating it by adding that “`We must stop race mixing.’” In 1974 Thompson celebrated the Klan as “a terrorist organization. … All our violence is secret, but we’re violent, take my word for it.’” The 1972 Lee birthday march ended with two African Americans arrested for attacking Thompson. Among the White supporters in the Lee parade was David Duke, a Louisiana State University student and Klansman who would go on to serve in the State House of Representatives and run several well-publicized albeit unsuccessful campaigns for Governor, the US Senate, and President. 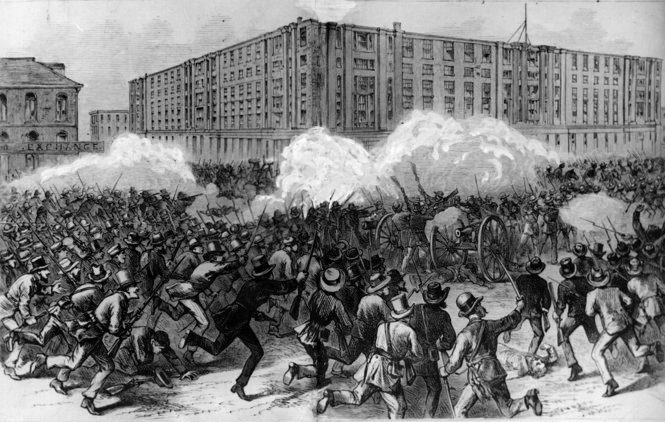 Frank Leslie’s Illustrated Newspaper included this image of the September, 1874 Liberty Place riot. 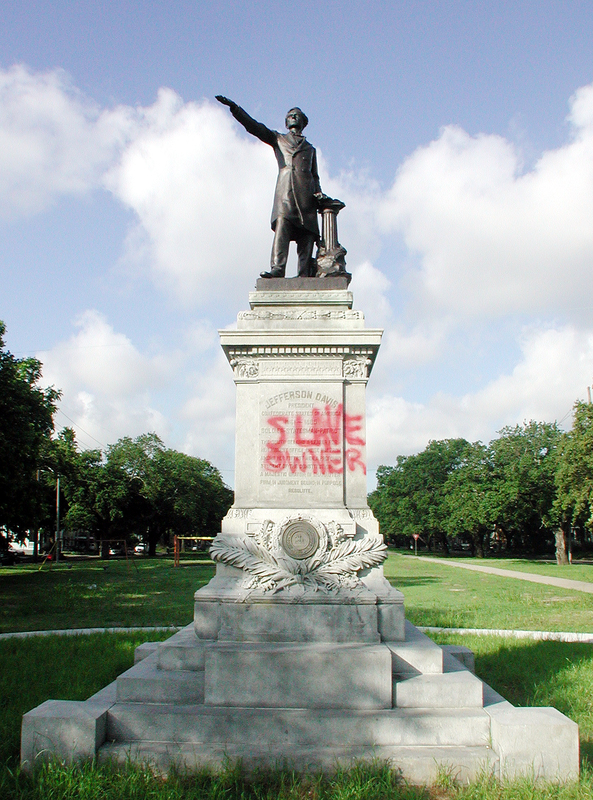 In December, 2015 the New Orleans City Council voted to remove four memorials associated with the city’s Confederate landscape. The most unsavory of the four monuments was erected in 1890 to commemorate what was long referred to as the “Battle of Liberty Place.” Over several days beginning on September 14, 1874 between 3500 and 5000 White League rioters led an insurrection against the Reconstruction government after a Republican victory (including an African-American Lieutenant Governor). Numerous Confederate veterans were in the White League’s ranks (about 44% were former Confederates), but 30% of its number were born after 1850 and had come to their anti-Reconstruction racism beyond the battlefield. The rioters occupied the State House and killed about 100 police and state militia in an especially violent effort to restore antebellum order. Formed in 1874, the White League was the paramilitary arm of the Democratic party, and their platform acknowledged that their goals included the “maintenance of our hereditary civilization and Christianity menaced by a stupid Africanization.” The White League violently prevented Republican political organization and intimidated or murdered African Americans and Republican voters. 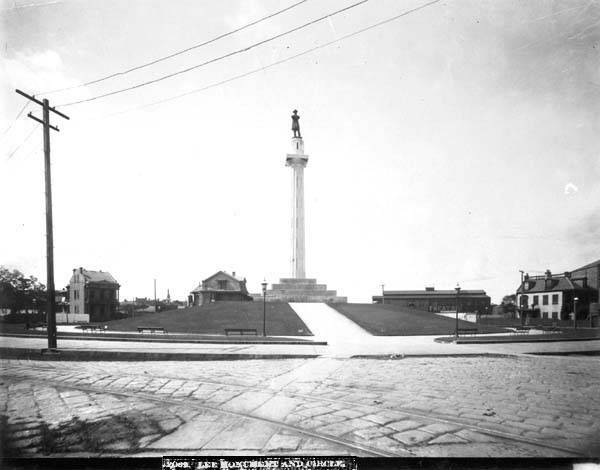 A 1912 image of the Liberty Place Memorial. In April 2017 the Liberty Place monument was the first of the four Confederate monuments to be removed, and the remaining three Confederates were removed in May: the 1911 Jefferson Davis monument was dismantled May 11th ; the 1915 General P. G. T. Beauregard Statue came down on May 17th; and the 1884 Lee statue was removed May 19th. They now sit in an undisclosed location awaiting a plan for their potential museum display (a suggestion to move the Lee monument to Washington and Lee University was rejected by the University). On one hand, perhaps these monuments are “raw wounds” that compel us to confront the underside of American history in public space. Arizona’s own state historian Marshall Trimble suggested as much when he defended Arizona’s Confederate memorials against the fate of the New Orleans monuments: “`One thing that America should be proud of is that it’s never tried to expunge or hide its history. 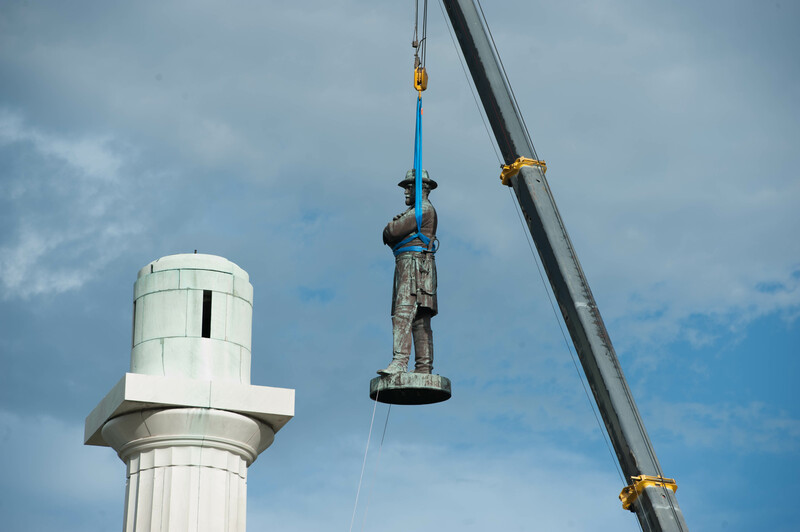 It’s: Let the world see its warts and all.’” Trimble paints monument removal as the erasure of history at the hands of unjust ideologues, descending to comparisons with authoritarians: “This is not Russia and it’s not Nazi Germany, this is America. We always show warts and all. And if we don’t show this—if we hide it, it gets eradicated and it’s like we’re changing our history.” On the other hand, neo-Confederates have had nearly nothing to say about those strategically unidentified sociohistorical “warts,” instead restricting most of their criticism of the Confederacy to critique of battlefield strategies. 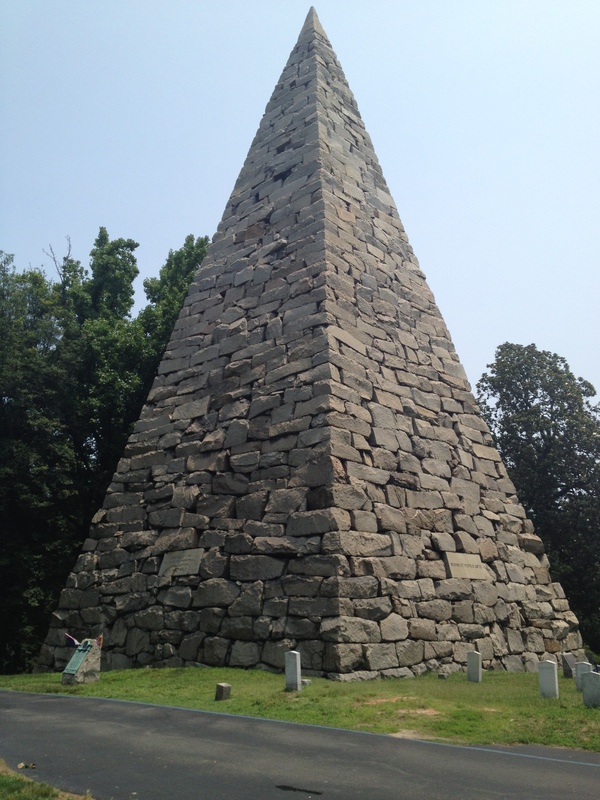 For defenders like Trimble, monuments are themselves inseparable from history itself, material and public confirmations of neo-Confederate fantasies. Yet every monument is instead an individual artifact with its own history capturing the imagination of its makers and audiences rather than an event or personage. Many defenders including Trimble believe leaving such monuments in place encourages historical clarity and will foster reflective dialogue. Yet Dell Upton ridicules the notion that leaving the Liberty Place monument in place displays “progress,” suggesting that we might as well return “White” and “Black” signs to water fountains. Knowing a dark heritage is not the same as celebrating it publicly in monuments on behalf of the state. There seems little likelihood the Civil War will be “forgotten,” but the distorted neo-Confederate picture of the Civil War and the subsequent 150 years will indeed be transformed. 2009 Mildred Lewis Rutherford (1851–1928): The Redefinition of New South White Womanhood. In Georgia Women: Their Lives and Times, eds Ann Short Chirhart and Betty Wood, pp. 272-296. University of Georgia Press, Athens. 1904 History of the Confederated Memorial Associations of the South. Graham Press, New Orleans. 2008 Neo-Confederacy: A Critical Introduction. University of Texas Press, Austin. 2011 The Jefferson Davis Highway: Contesting the Confederacy in the Pacific Northwest. Journal of American Studies 45(2): 281 – 301. 2012 The Generation of Postmemory: Writing and Visual Culture After the Holocaust. Columbia University Press, New York. 2006 Uncivil War: Five New Orleans Street Battles and the Rise and Fall of Radical Reconstruction. LSU Press, Baton Rouge. 1922 History of New Orleans. The Lewis Publishing Company, Chicago. 2014 Recalling Deeds Immortal: Florida Monuments to the Civil War. University Press of Florida, Gainesville. 2012 The Civil War in Arizona: The Story of the California Volunteers, 1861–1865. University of Oklahoma Press, Norman. 2010 New Orleans after the Civil War: Race, Politics, and a New Birth of Freedom. Johns Hopkins University press, Baltimore, Maryland. 2012 Disorderly History: Cultural Landscapes, Racial Violence, and Memory, 1876-1923. Masters Thesis. University of Pennsylvania, Philadelphia, PA.
1997 Standing Soldiers, Kneeling Slaves: Race, War, and Monument in Nineteenth-Century America. Princeton University Press, Princeton. 2015 What Can and Can’t be Said: Race, Uplift, and Monument Building in the Contemporary South. Yale University Press, New Haven, Connecticut. 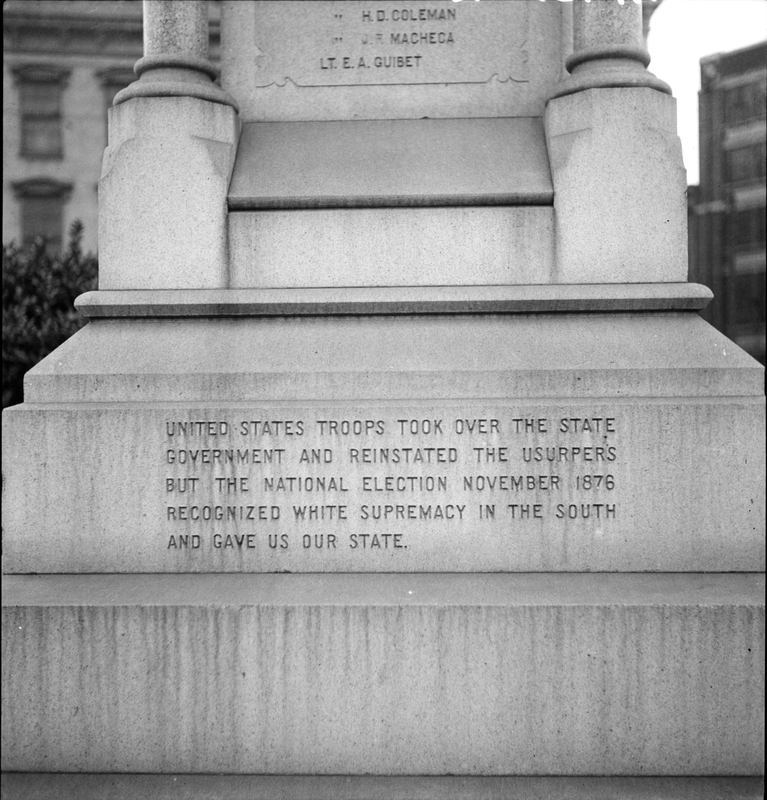 1983 “Lest We Forget”: The Confederate Monument and the Southern Townscape. Southeastern Geographer 23(2): 107-121. Liberty Place Monument 1912 image from Winter in New Orleans season 1912-1913. 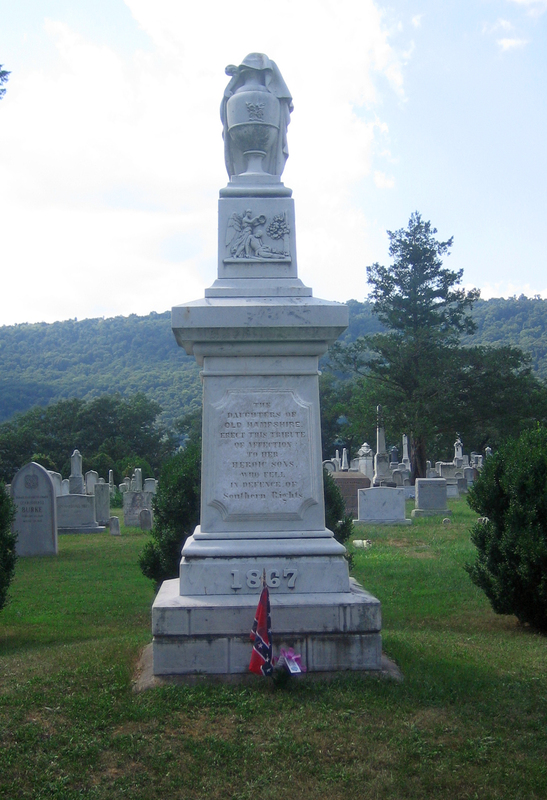 Romney West Virginia Confederate Memorial image from Justin A. Wilcox/wikimedia. Posted on June 16, 2017, in Uncategorized and tagged #WPLongform, civil war, monuments, neo-Confederacy, New Orleans, Phoenix. Bookmark the permalink. 10 Comments. Wow, this is an incredible piece–definitely a tour-de-force through archaeology, monuments, and with a wonderful concluding statement. I’ve used it for an update to my classnotes on the question of Is Nationalism Bad? Thanks, the material really is fascinating–cool things, great primary documents, compelling contemporary heritage discourses, and some interesting regional and local wrinkles with implications for much bigger questions.